When choosing a database to suit your company’s needs, there are numerous factors to consider. For example, you must think about the growth vectors for your business, portability of your data to other environments, staying ahead of your competition and reducing your dependence on single large vendors. But as you consider all of these different components, there is one other thing you must inevitably assess: costs. Many successful applications in the entertainment, e-commerce, advertising, travel, social and transportation industries fall into one of these three scenarios, making this a good starting point to assess costs. In evaluating these scenarios, we concluded that Redis Enterprise VPC offered savings across the board. 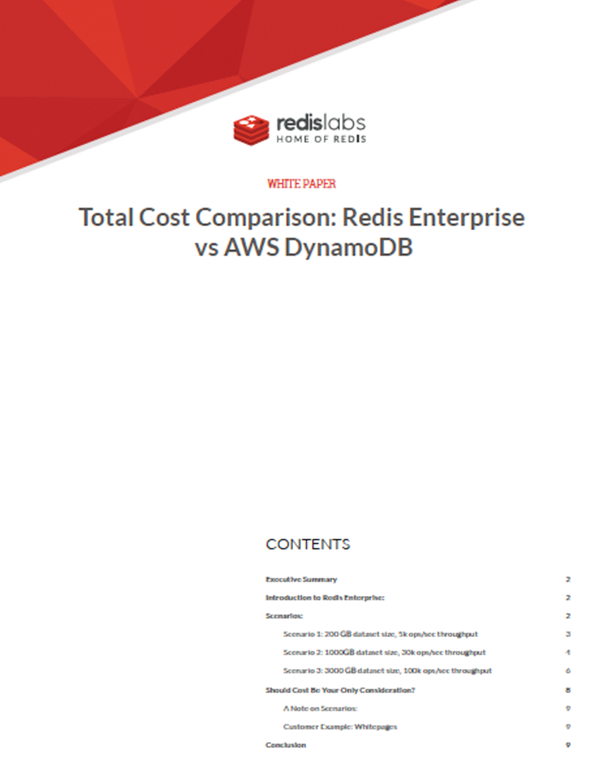 Redis Enterprise’s reserved instance resulted in average savings of 49 percent as compared to DynamoDB’s reserved instance, while Redis’ on-demand instance generated up to 66 percent in savings. These savings were also consistent for Redis Enterprise’s flash and cloud resources, making it a much more cost-effective option than DynamoDB. Please download our ebook to take a closer look at these cost comparisons. But Redis Enterprise is not just more cost-effective than DynamoDB. It is also fundamentally richer in developer features, with a wide range of built-in data structures and modules enabling Redis to process much more advanced data with much lower latencies. Redis Enterprise is well-known for its high availability, data persistence, linear scalability, automatic failover and, of course, its active-active dataset distribution mechanism. In fact, all of these different features make Redis Enterprise even more cost-effective, because it is able to orchestrate exceptional performance using minimal resources. Redis Enterprise also protects businesses that are reassessing their data requirements or changing their operating environments by allowing them to set up hybrid clusters that span clouds and on-premises environments, thus ensuring that they are not tied down to any one provider or location. Whitepages is one such business; after initially storing its data on Amazon ElastiCache, Whitepages wanted to switch to a database that could handle large amounts of data while still providing single-digit latency — and Redis Enterprise was that database. To learn more about how Redis Enterprise could be a cost-effective solution for your company, and about what other considerations you should make when choosing a database, please download our ebook.